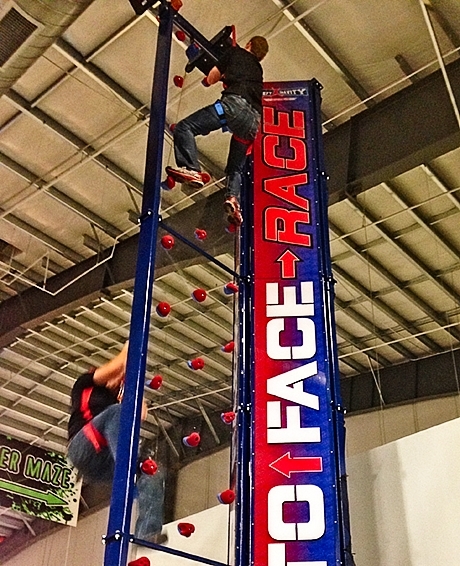 The Face-to-Face-Race has a free-standing steel frame that does not connect to your ceiling or walls. Mechanical wedge anchors are used to attach it to your concrete floor. The standard height is 24.5′, and custom heights are available to accommodate other heights. It is not currently designed for outdoor use, but our highly trained sales staff can walk you through other options. Our exclusive Auto-Belay system ensures that this climbing wall is safe and easy to operate. Once the climber is connected, the auto-belay will safely and automatically lower them from any point on the climbing wall. Utilizing an auto-belay allows one staff member to supervise up to 5 climbers at one time. This is the perfect climbing wall for trampoline parks, family entertainment centers, and can be combined with our Klime Wallz to create a complete adventure arena.